There’s pushback on a grand and global scale against climate action and in support of fossil fuels, no more so than in the US and Australia, but there’s a counter pushback that’s arguably bigger and more powerful and is on a growth curve. In California last month it showed its muscle. The Global Climate Action Summit in San Francisco last month, convened by America’s Pledge Co-Chairs Mike Bloomberg and California Governor Jerry Brown, brought over 4000 business, city, state and civil society delegates from all over the world to make many ambitious commitments to tackle climate change. A highlight of the event included 29 philanthropists pledging $4 billion over the next five years to combat climate change—the largest-ever philanthropic investment focused on climate change mitigation – to accelerate proven climate and clean-energy strategies, spur innovation and support organisations around the world working to protect the air they breathe and the communities they call home. According to Mike Bloomberg and California Governor Jerry Brown, even without the Trump Administration, the US is upholding its commitment to the Paris Climate Agreement. Bloomberg, who is now the UN Secretary-General’s Special Envoy for Climate Action said that because of initiatives already taken by cities, states and businesses to reduce carbon emissions, the United States is already almost halfway to meeting its 2025 Paris Agreement goal. “Those groups are positioning the US to uphold our end of the Paris Agreement, no matter what happens in Washington,” he said. Existing commitments and policies can also take the country two-thirds of the way, even without federal support on climate action, he said, while launching a new report highlighting plausible pathways to further decarbonisation. If this state-level commitment spreads, they calculate that it could carry the United States “within striking distance of meeting its 2025 Paris pledge”. The report Fulfilling America’s Pledge was prepared by researchers at the University of Maryland and independent think tank the Rocky Mountain Institute. 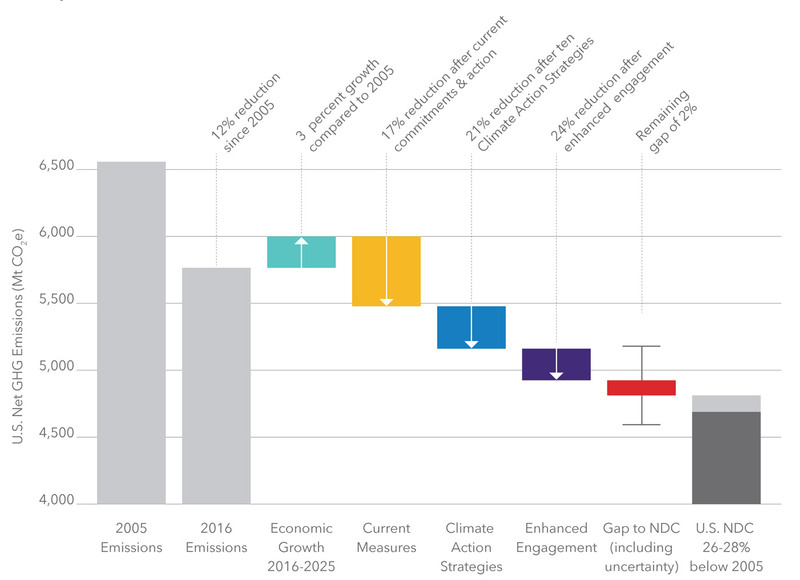 Using a purpose-built integrated assessment model incorporating thousands of data points from across many non-federal actors, it finds that current commitments and market forces will cut economy-wide emissions 17 per cent below 2005 levels by 2025. The pathways highlighted include: setting and implementing more stringent renewable energy procurement policies, accelerating the phase out of super-polluting refrigerant gases, and mapping and repairing methane leaks from natural gas pipelines. But Senator Brown cautioned that “there is still a mountain to climb”. Brown, who finishes his stint as senator later this year, also announced executive order B-55-18: that the state should reach carbon neutrality by 2045, quite an undertaking. He also announced a plan to launch a satellite that will track climate change-causing pollutants with unprecedented precision. Then, a new report from the Global Commission on the Economy and Climate, co-chaired by economist Lord Nicholas Stern, Unilever chief executive Paul Polman and Ngozi Okonjo-Iweala, former finance minister of Nigeria (the fourth report in a series), makes the case that climate action could bring $26 trillion into the world’s economy by 2030 — creating 65 million new low-carbon jobs, preventing more than 700,000 premature deaths and generating an estimated US$2.8 trillion in new government revenue via subsidy reform and carbon pricing. 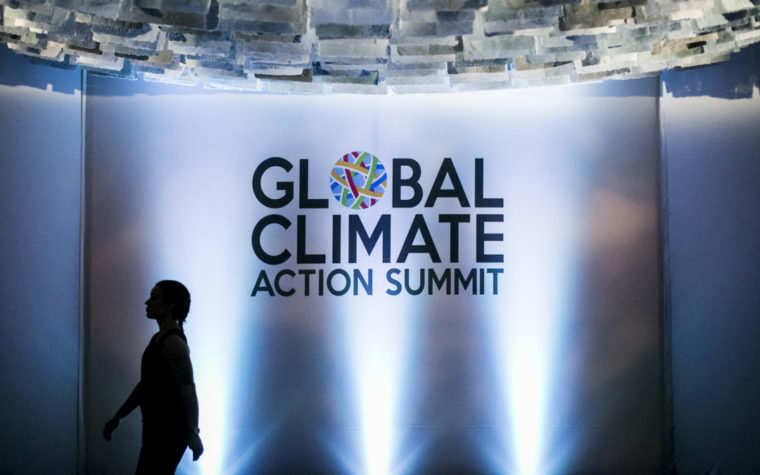 “The momentum from businesses, states, cities, investors and citizens is now unstoppable, not least because those taking bold climate action are already seeing tangible benefits,” Polman said. “But if we are to unlock the full benefits of this new low-carbon growth opportunity and avoid runaway climate change, economic and financial leaders in both government and the private sector need to do even more, and fast,” Polman said. They and many other speakers supported the need for carbon pricing to drive the phase out of fossil fuels and raise revenue for the transition, set at $40 to $80 per ton of carbon dioxide emissions. The alliance is “dedicated to harnessing the power of emerging technologies and the fourth industrial revolution to help reduce greenhouse gas (GHG) emissions across all economic sectors and ensure a climate turning point by 2020”. Signatories have made different commitments. Salesforce has committed to achieving 100 per cent renewable energy by 2022 and to work with its top suppliers to set their own emissions reduction targets by 2025. Lyft has committed to full carbon neutrality and renewable energy. WeWork has pledged to become carbon neutral by 2023, as well as phasing out disposable plastics and meat. The initiative is a collaboration between the CDP, UN Global Compact, the World Resources Institute, and WWF, with the aim of making science-based target setting the standard in business practice to drive down global greenhouse gas emissions. When California declared its original ambitions in the policy known as AB 32, sceptical nay-sayers forecast sky high petrol prices and the leaching of jobs. The opposite has happened: job growth increased 16 per cent in California compared to 10 per cent for the rest of the nation, over the same period, with unemployment at a record low of 4.2 per cent in August for the fifth month in succession. Compared to other places, like oil-state Texas, California’s economy is performing better on most measures, showing that it is entirely possible to combine steep emission reductions with vibrant growth. Between 2012 and 2017 is economy grew almost twice as fast as the rest of the USA, expanding by 24 per cent. It’s climate policy leadership attracted over $22 billion in venture capital funding over the last decade, resulting in the creation of many new companies in the transitional economy that now support around half a million jobs. These include Tesla, Proterra (electric buses), Charge Point (electric vehicle charging), SunPower and SunRun (solar), and Picarro (pollution detection). Over the same period manufacturing output in Texas shrank by one per cent in 2017 compared to 2011 partly because of oil price volatility. Nevertheless, while between 2015 and 2016, California’s total GHG emissions fell 2.7 per cent, primarily due to electricity generation GHG reductions, it will have to achieve just over 4 per cent annual declines between 2020 and 2030 in order to achieve its 2030 emissions goal. The real challenge lies in the transportation sector, which accounted for 40.5 per cent of the state’s total greenhouse gas emissions in 2016. Yet California’s experience shows that passing some of the most ambitious climate legislation in the world has certainly not had a negative effect on business, manufacturing and jobs. The global carbon footprint currently makes up 60 per cent of humanity’s total ecological footprint. According to Mathis Wackernagel, Co-founder and president, Global Footprint Network, none of the above goes far enough. “We need to take bigger leaps,” he told the summit. “The Paris goal implies to keep greenhouse gases well under 450 parts per million in the atmosphere. Yet US government sources recognise that we’re already at over 493 parts per million.” He goes on in his article to lament that this simple fact is not widely known. Wackernagel convened a One Planet Progress Panel jointly produced with the Dutch Consulate as an affiliate event of the Global Climate Action Summit. Kevin Self, chief strategy officer for the French company Schneider Electric in North America. At this summit. Steve Howard, a chief engineer behind IKEAs sustainability transformation, called it the last business frontier and the only logical path forward. Ecuador’s former President Rosalía Arteaga, the fourth woman ever elected head of state in Latin America, argued that embracing one-planet living is the reason why she is so excited about sustainability education: that compass holds the decisive key to a prosperous future for all. The California Climate Summit also saw the launch of Cities4Forests, a voluntary coalition involving 45 mayors’ offices supported by other subnational agencies from around the world. They pledged to catalyse political, social, and economic support among city governments and urban residents to integrate forests, whether within the cities, nearby or far away, into city development programmes. Participants will share information on how to help reduce deforestation, restore forests (including more trees in cities), and manage forests more sustainably because of the multiple benefits they provide. The headline message from the event was that the world needs more determined leadership for a rapid transition towards a net-zero emissions society before the middle of this century, that realises the ambition of the Paris Agreement. David Thorpe is a UK based writer, regular contributor to The Fifth Estate and author of Passive Solar Architecture Pocket Reference and Solar Energy Pocket Reference.